Orchestra is a new formalism on which we are working in the field of cooperative systems design. In CoCSys methodology for Cooperative Capillary Systems design, we transform partial scenarios describing particular cooperative situations in a more comprehensive Cooperative Behaviour Model (CBM). 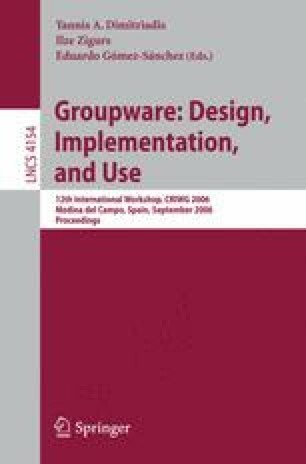 In this paper, we describe our contribution to the need for a graphical formalism which would be able to express in a natural way, understandable by different actors (users, designers, developers,...) different cooperation situations in an ambient intelligence environment (mobile, context-aware, proactive and ubiquitous). ORCHESTRA is complementary to CTT and UML Use cases, and its objective is to express clearly cooperation situations (explaining easily synchronous or asynchronous cooperation activities) and the role (active or passive) played instantaneously by each actor. We take into account main concepts of “cooperative world” which are Actors, Roles, Groups, Tasks, Processes, Artefacts (Tools and Objects) and Contexts (Platforms, Situations and Users). With Orchestra formalism we try to express by a sort of music staff individual and collective behaviours. In this way we can model either individual works or organized collective activities. We present this formalism, its metamodel and its use for the description of two cooperative situations. We describe also a transformational process projecting a ORCHESTRA description on the cooperative architecture.